The Bay Bridge Trail of the Bay Bridge. Courtesy of Joe Mathews. Which is why I recently found myself putting on a windbreaker and beginning a long, slow walk across the east span of the Bay Bridge, from Oakland to Yerba Buena Island. This piece of the bridge, completed in 2013, is probably the biggest California mistake of the last generation. The east span was completed a decade late, cost seven times more than official projections, and remains dogged by serious safety concerns. 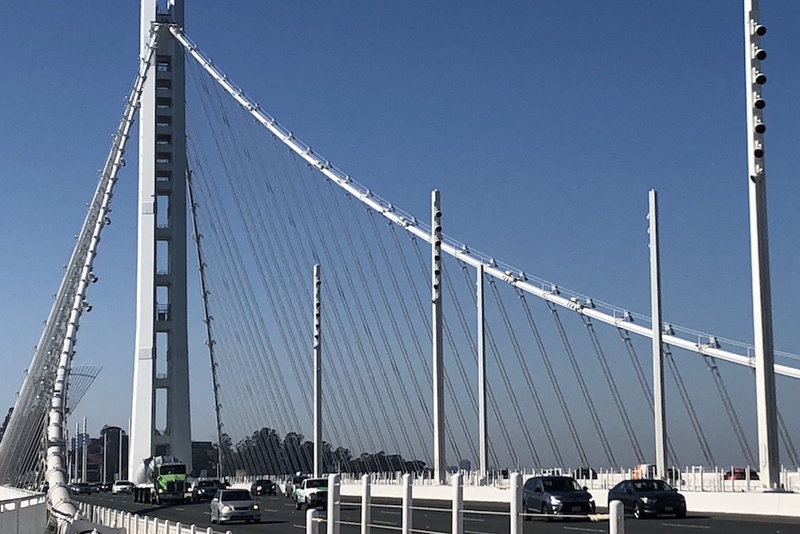 However, the bridge does have one virtue: It holds lessons for the future, as California faces massive challenges that will necessitate big projects. Indeed, after eight years of the cautious, small-bore governorship of Jerry Brown, new state leaders are preparing to take on big initiatives on infrastructure, taxation, and early childhood. Before they do, they should read a recently published book I brought on my bridge walk: A Tale of Two Bridges, by Stephen D. Mikesell, a Davis-based historian who previously served as deputy historic preservation officer for the state. Mikesell compares the original 1936 Bay Bridge with the troubled 2013 east span, but his book is really about the special challenges of megaprojects—that is, complex and controversial initiatives costing more than $1 billion. Today’s cynical conventional wisdom is that big projects are nearly impossible to carry off, and that those that do go forward are destined to fail. But Mikesell argues otherwise. He explains that the original 1936 Bay Bridge met conditions for successful megaprojects. First, local and state leaders built broad consensus about the purpose and need for the project: constructing a bridge from San Francisco to Oakland was clearly a game-changer for the region in that era. Second, political people made the political decisions about the bridge, and technical people made the technical decisions. While a politically appointed commission approved the bridge and its budget, the details of design and construction were left to technical experts brought in from all over the country. Third, costs were estimated accurately and the bridge came in under budget. And finally, the bridge builders used proven methods for construction and materials, emphasizing functionality rather than trying to make an artistic statement. The 2013 eastern span didn’t pass all these tests, Mikesell writes. The bridge was a divisive political issue for years. Cost estimates were way off. Technical decisions about bridge design and engineering were made through political processes. And the crucial political decision—to build an expensive new span instead of a less costly retrofit of the old span—was made inside Caltrans. Who were these decisionmaker? Shockingly, Mikesell, a seasoned expert on bridges, writes that the process was so messy it’s impossible to identify exactly who was responsible. Ultimately, warnings from leading bridge engineers were ignored as Bay Area political leaders chose what they saw as the most visually attractive bridge—a self-anchored suspension bridge—even though this less common design created all sorts of problems. The bridge does have one virtue: It holds lessons for the future, as California faces massive challenges that will necessitate big projects. To walk the span today is to get a firsthand sense of a bridge gone wrong. The walkway itself offers the first clue: It’s on the wrong side of the bridge, the south side, which means that you get a view of the port of Oakland. If the walkway had been on the north-facing side, better views of the north bay, and even the Golden Gate, might have been possible. The walk is also polluted from the passing cars. I was often startled by loud noises from trucks hitting seams on the bridge; the eastbound traffic is so close it feels like it might run you over. It took me nearly an hour to walk from a small parking lot at the Bay Bridge Trail entry point on Burma Road to the bridge’s signature tower and curve. There is nothing particularly beautiful or interesting about this tower and the cables attached to it. That’s a shame, since this is the section of the bridge that created most of the cost overruns. The tower is also the site of many structural problems, including saltwater intrusion into the foundation, damage to anchor rods, and substandard welds. The bridge is also a failure because of what it didn’t do. Big projects should be transformational. But this span isn’t. It didn’t increase the bridge capacity or improve traffic flows. It is no artistic masterpiece. Paying for it actually raised bridge tolls. And prominent engineers argue that the new span may be more prone to fail in an earthquake that the old bridge it replaced. Now that Newsom is becoming governor—and promising big things—perhaps he can turn the bridge into a perverse inspiration by following its essential lessons. Any big project must be truly transformational, providing a service or a connection that truly changes people’s lives. Paradoxically, the execution of such transformations must be intensely practical and risk-averse, emphasizing function over form. How might such lessons be applied? If Newsom wants to build a single-payer health care system, it shouldn’t be the gold-plated model that progressive groups have been advocating for, but rather something simple, cheap and sturdy, covering everyone. He’ll need to resist efforts to make his promised new systems for taxation, homebuilding, and early childhood highly complex with loads of new formulas; the simplest systems are more likely to be durably transformational. After reaching Yerba Buena Island, I walked around and enjoyed views of Newsom’s city of San Francisco for a few minutes. Tired and sweaty, I called for a Lyft to take me back to Oakland. But no driver would come. So I trudged all the way back, on sore feet, repeating my earlier mistake.